Improper Course: Olympic Shutout - Where To Start? 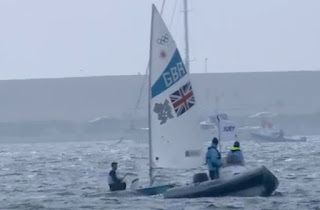 Olympic sailing was closely judged. Something happened a few years ago that really disturbed me. I was at a Laser event in Colorado sailing in a light-wind race. We were on a run and I was leading about 100' in front of a college sailor. He did one of those really violent jibes that gained him about 30 feet. And then he did it again. I thought, not cool. When he did it a third time I said "One more time and I'll take you to the room." The only thing in sailing I hate more than having to protest someone is cheating. This young and very talented sailor immediately jibed again and shot past me. I told him, "OK pal, we're going to the room." On the finish line, I informed the race committee and filed the protest thinking this is not how I want to spend my vacation time, but this has to be done. To my horror, my protest was thrown out on a technicality. You see, I did not say the words "I protest you." Two things disturbed me: that this guy was unafraid of openly cheating, and that he was coached so well that he knew the rules better than me. Master sailor: watched the top 3 guys roll gybe their way downwind. Completely illegally. I protested one kid, he responds with "F-You" and many other expletives... The kids are smart, but they are completely unmannered and to me have crossed the line of what I consider sportsman like... We should have some sort of National Level Laser Kinetics panel, come up with guidelines and stick to them. Force judges to enforce rules and remove them from judging if they can't... What are the college coaches teaching the college level sailors? Win at all cost, even cheat? College coach: I was shocked that the judges and coaches watched and allowed it. Severe kinetics are taught, and these skills are encouraged if the “others” are doing it. This is not good, and like you, I don’t appreciate it; I dislike it. I teach my people how to roll tack and jibe, but tell them there must be a strategic purpose for the tack or jibe; they cannot be repeated for the sole purpose of accelerating. I have heard that many European events penalize sailors for their tacks and jibes if they come out faster than they went in. Rewind the tape another few years when I was competing at the O’Day's, a US Sailing event that was held in very light conditions. One of the judges publicly stated that there was no such thing as an illegal roll tack “because it requires skill.” You can imagine what that event was like! 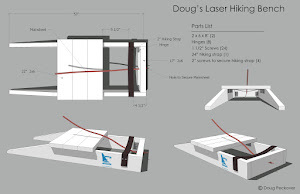 Rewind the tape a few more years, and I posted this on the Laser forum: "There is another reason to stop cheating. If North Americans are going to do well at the Open Worlds or Olympics, they will need to sail by the same rules here as they will have to sail by elsewhere. None of our Open hopefuls are going to have a chance at judged events if they have to sail here with people who cheat." An ISAF International Judge added, "It seems as if USA is well behind the rest of Europe at least, if not other parts of the world... Time to catch up guys?" Rewind the tape one more time to 1997 right after the after the Master Worlds in Chile. An Aussie multiple world champion sent me a letter about the "totally fair and professional fashion in which you contested the series, resulting in your win being universally popular within the fleet." Translation: You're from North America and you did not cheat. While this letter means a lot to me, it was sad to be considered an anomaly. Fast forward to 2012. Traditionally, the Aussies have been fast in breezy conditions and North American sailors have been fast in lighter conditions. But we have lost this advantage because the Aussies have recently become extremely competitive in lighter conditions. After the latest Laser Worlds Tom Slingsby said, "This is my fifth Laser world title but it's my first in light conditions which is really satisfying.” I also noted the Aussies and Kiwis improved light air speed at the Brisbane Master Worlds, so getting competitive just got a lot harder. 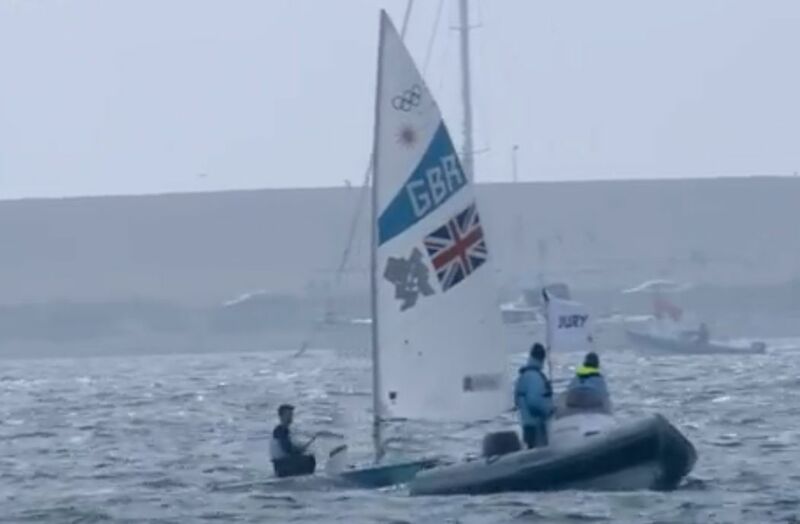 It's especially important to fix this cheating in the Laser class because of the many talented sailors who go on to sail other Olympic classes. US Sailing is now promising "an extensive review of why the Americans were so uncompetitive in an Olympics." I'd say that copying the Aussies ethical way of sailing would be a great place to start. I lived in Australia for 8 years and know that they would never put up with the crap that we have in North America. Their three gold and one silver to our zero should be a great incentive. 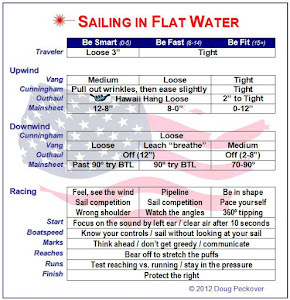 Rule 42 is changed for college sailing in the US in a way that allows more use of kinetics than under the Rule 42 used in real sailing. Of course that does not give college sailors an excuse to cheat in real sailing. Perhaps an easy first thing that can be done to help US win more medals in future is to run college sailing under the real Rule 42? Another part of the Laser forum post was "Do these [world champion] sailors bend or break the rules when they sail at home? I doubt it. They know that how you practice is how you race. If they see someone at home cheating, they might yell or even protest, but I'm sure they do not change their style. These sailors are class acts and will continue to win world championships." And they have - more than a dozen since that post! 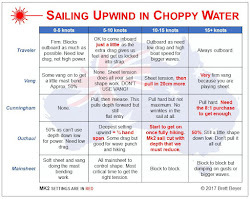 IMHO, college sailing harms Olympic sailing if it teaches the wrong skills. There are plenty of recipes which might be easy and quick to come up with. Position the cooking serving from the your oven. the difference between Ceiling fan Forced and as well Groupie Made it easier Burning? is just like a low backyard cooking carrier. Per convection oven's a mystery to be evenly-cooking provisions may be due to the distinguished convection fashionable. Out done the same identical method previously, next served very much better As however it ordinarily figured sweaty. Permitted that there grow to be light fixture?